Article first published as Baba Ghanoush on Blogcritics. I wish eggplant would frequent my kitchen more often. If it weren't for my eggplant-detesting husband, I could prepare some glorious eggplant dishes. The thing is, I know I could prepare them but seeing that I'd probably be the only one to eat anything containing the beautiful purple vegetable, chances are I'd be eating the same dish for days. We all know that's not good eats. But for the Mediterranea Kabob Party I threw, I was excited about going to the store and buying an eggplant! With it, I prepared this Baba Ghanoush - a roasted eggplant dip that's creamy, light and full of flavorful depth. It's a great feeling to have others share an eggplant dish with me so that I'm not stuck to eat it all by myself! Whenever we dine out and baba ghanoush is on the menu, I immediately want to order it just to get my eggplant fix. I didn't realize how easy it is to make at home! You probably have a majority of the ingredients already in your pantry and if anything, you may have to get 3 items to make baba ghanoush. Those three items include an eggplant, tahini (sesame seed paste) and sesame seeds. Look for tahini and sesame in the international aisles of your grocery store or any mediterranean/middle Eastern market if you have one in your neighborhood. The eggplant is roasted in the oven for about 30-40 depending on how big your eggplant is. While in the oven, it will shrink down a bit and you'll be left with the softened insides of the eggplant. The insides are scooped out and processed with the remaining ingredients. It's important to chill the mixture for a few hours in order for the flavors to meld. So this makes a great appetizer you can make ahead of time. 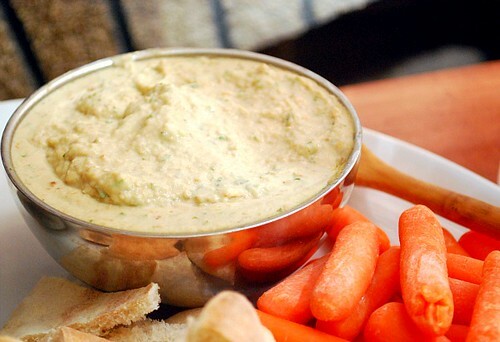 Serve with crudités and warm pita bread as an appetizer or a snack anytime of day! Place eggplant on baking sheet, and make holes in the skin with a fork. Roast it for 30 to 40 minutes, turning occasionally, or until soft. Remove from oven, and place into a large bowl of cold water. Remove from water, and peel skin off. Place eggplant, lemon juice, tahini, sesame seeds, and garlic in an electric blender, and puree. Season with salt and pepper to taste. Transfer eggplant mixture to a medium size mixing bowl, and slowly mix in olive oil. Refrigerate for 3 hours before serving. My husband also refuses to even look at eggplant, and I love it! I think I will make this dip to bring to a barbeque where I can find some eggplant loving friends to share it with! OMG! I use to make this all of the time YEARS AGO! I guess we overdosed on it because I haven't made it in such a long time that I forgot about it. I have no idea where my recipe is, but it doesn't matter because yours looks fantastic! Thanks so much for posting this!